As a world-famous supermodel known for wearing a different outfit every day, the pressure is constantly on for Claudia Schiffer to come up with a new stylish ensemble. And today the blonde went one further, wearing a cashmere jumper dress very similar to one from her own collection as she stepped out alongside husband Matthew Vaughn. The 41-year-old looked stunning in the blue top, which appeared to be a longer version of one sold for £298.00 on her site. 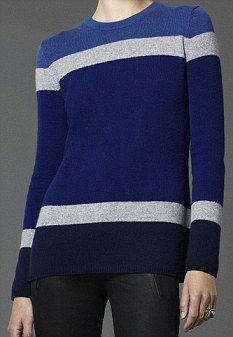 Though there isn't an identical dress in her online store collection, Claudia Schiffer Cashmere, the stripes and colours are identical to one of the tops. The model's collection, which is her first, is designed to be ‘thrown on’ in the morning in order to ‘look chic no matter what. Claudia and her husband Matthew recently recently moved to a Suffolk mansion after calling on an exorcist to banish a ghost from their country pile. The £5 million property naturally includes a barn for Claudia to store her clothes. Earlier this summer Stowe-educated Vaughn was at the centre of speculation about Jones’s baby after he directed the actress, who bears more than a passing resemblance to his wife, in the latest film of the X-Men franchise. January added fuel to the intrigue when she failed to address the question on his birth certificate, leaving a 'big, fat blank spot' where the father's name would normally be printed, according to TMZ. Matthew categorically denied he is the father and said that the allegations were ‘deeply hurtful’ and that everything is fine with his marriage to Claudia.